The Cascade Pannier Kit for your KLR650E is a great alternative to the Teton when you want greater capacity without extra width. The 7.5" Cascade creates more volume (38.5L) with increased height, not width. By comparison, the Teton 7.5" gives you 33L, the Teton 9" gives you 38L. 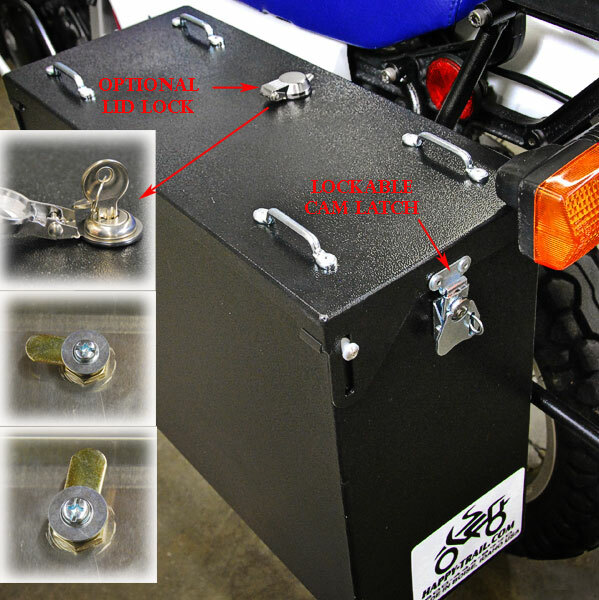 Aluminum Top Box Compatibility Note: On the E series KLR650 with Cascade panniers the QRL top box system cannot be used. The pannier interferes with the QRL. Additionally, 33 and 58 Liter Happy Trail Top Boxes cannot be used because of their width. The 15, 29, 43, and 47 Liter top boxes can be used with just the isolator kit mount option with Cascade panniers. The KLRE SU rack has our new Point1 pressed insert design. This adds to the ease and functionality you have come to expect from our pannier systems. Details HERE. Tim says: For the 08+ KLR650 I recommend 7.5" panniers. Pannier kit does not include a tail rack or top box mounting plate. The premount we do is parralel with the SU rack, The angle shown would be the angle that you would get. You can also order the panniers with no premount and mount them yourself. Pannier come with decals, the decals are reflective. They remove easily with some heat. When you order you cann add a note to delete the decals. On your panniers you have strap guides or anchors for soft bags to tie down. Where can I get some of these please? What are they actually called?